The next time some Tesla bro corners you in the locker room at the gym, dripping and wearing only a towel while he explains to you, finger jabbing into your sternum, that he’s saving the world and defeating the massive oil industry’s stranglehold on America, and you, you’re the problem, just stop him right there and let him know this: The real EVs that are making a dent in global oil demand are not Teslas, but Chinese buses. Yes, electric buses, the vast majority of which are in use in China, are responsible for more than three times the displacement of oil demand compared to all of the world’s private electric passenger vehicles. That’s 270,000 barrels of oil per day not being used thanks to electric buses. 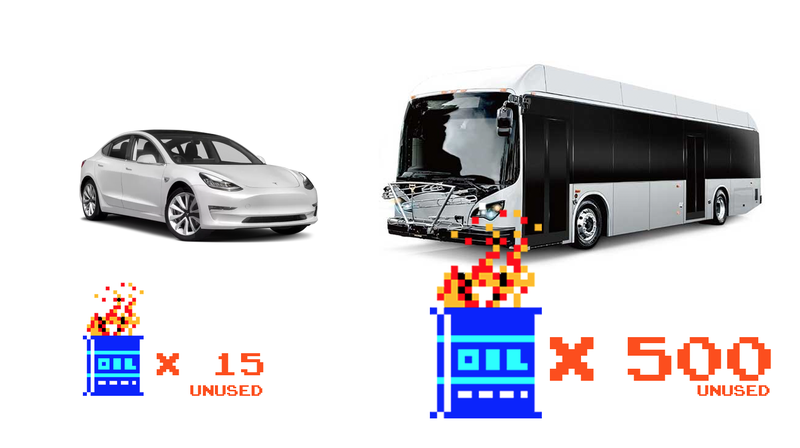 To put it another way, for every 1,000 electric buses in use, 500 barrels of oil aren’t used each day, and for every 1,000 private electric cars in use, only 15 barrels of oil go un-slurped. That’s a pretty huge difference. So why are these mostly clustered in China? Why don’t we see more electric buses in America? The nature of bus trips, with their regular and largely unvarying routes should make them ideal candidates for electrification, right? Well, yes. So far, though, where China uses 300,000 battery-powered buses, there’s only about 1,600 in the U.S. There’s a number of reasons why buses should make a ton of sense—less direct pollution, significantly fewer moving parts and a much reduced need for fluid replacements, making maintenance cheaper and easier, for example, but despite a lot of compelling reasons, they’ve been slow to be adopted in America. The reasons aren’t pegged to any one thing—while some places like Los Angeles have had a terrible time keeping their Chinese-built BYD electric buses on the road and running, mechanical issues aren’t—or at least shouldn’t—be a deal breaker, since there’s 300,000 that manage to do their job in China. What seems to be the bigger issue is simple “policy and institutional inertia,” according to Hanjiro Ambrose, a Ph.D candidate from U.C. Davis who studies sustainable transportation and was interviewed in Streetsblog late last year. Most experts agree the technology is there to make these work, but without a strong central policy push like exists in China, there’s just not that much incentive for bus systems to do such a comprehensive change-over. Chances are that’ll change in the future, though, and then you’ll just have to deal with bus drivers at the gym telling you how they’re saving the world.